It's been ages since I last played Star Wars. I've been just under level 39 for about a month. Yesterday I called my friend on Skype though, and we dragged our boyfriends with us to Maelstrom Prison. It was great fun! The flashpoint apparently featured one of my favorite enemies: Grand Moff Kilran (picture to the right). His voice actor does a great job. He sounds extremely posh and confident about killing you (even though we've already defeated him before), which is fun. It must be great to have such self-confidence, because we just killed him again. There were also these huge high-ranked robots patrolling everywhere in the hallways, of which I wasn't sure of their function. We could just all four DPS them, I didn't even have to put a bubble on someone, and we'd all still be on full health after killing them within several seconds. Weird stuff. I was also surprised in general by how well we were doing, given the fact that we all hadn't played our characters for a month. We had no deaths whatsoever. The most fun part about the flashpoint was that it actually contained some good Star Wars-lore. 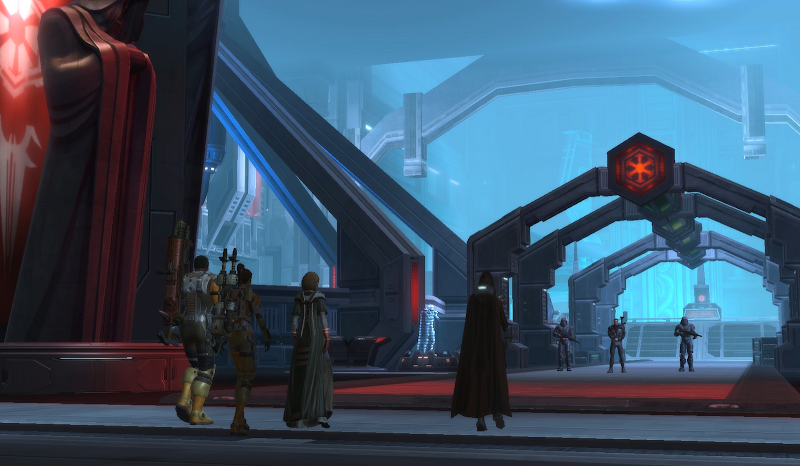 I've played the old Star Wars: Knights of the Old Republic (let's be honest, who hasn't? 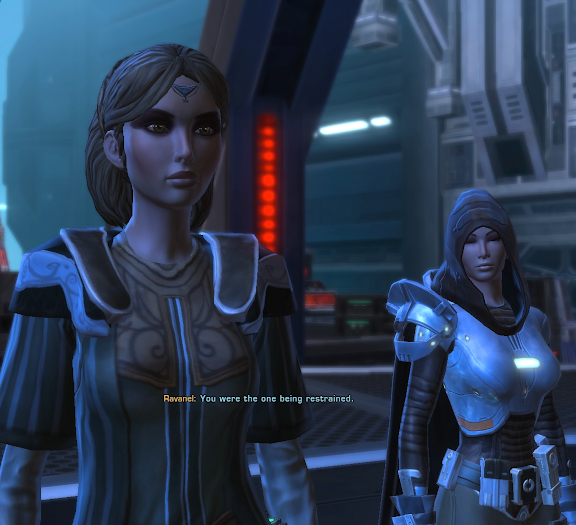 ), in which you play Revan, a fallen jedi who returns to the light side. At the end of that story, Revan disappears into deep space to look for the Emperor. In this flashpoint, you find out what happened afterwards. Apparently Revan was caught by the Emperor, being imprisoned and artificially kept alive to control his mind and learn about the light side. 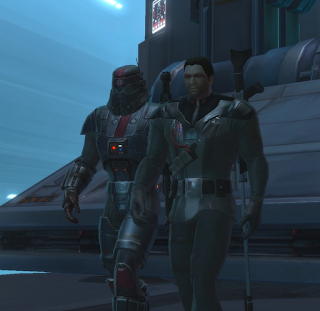 While being in this condition, Revan was able to influence the Emperor slightly through the bond they had, resulting in the peace treaty that stands during the story of SWTOR. Now it was time to free poor Revan from his bonds, guided by the spirit of Meetra Surik (who apparently is the protagonist of the second KotOR game, which I haven't played though). I was a bit shocked to find out that Revan had undergone a gender transformation, as I played him as a woman during KotOR, but it was awesome to play through this storyline nevertheless. I love the part "we dragged our boyfriends with us"!